Have a question about our wire ropes inventory? Need help finding a specific product? Fill out the form below and a representative will contact you shortly. For an even faster reponse time, call us 800-927-8549. Armstrong Alar Chain Corporation offers a full line of wire rope accessories for connections, securing, tensioning, turnbuckles, and more. Our wire rope accessories are manufactured in galvanized steel, stainless steel, and zinc plated steel. 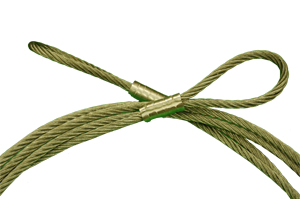 We carries wire rope clips in sizes available from 1/16” to 1-1/8”. Also referred to as a U-Bolt clamps the end of a wire rope that’s been looped back through to form an eye. The wire bolt clip is tightened with two nuts for even tightening on either side. For added strength to a wire rope eye, you can introduce a wire rope thimble inside the loop of the eye formed with wire rope and wire rope clip. The wire rope thimble lines the inside lip of the wire rope loop so that clips or other accessories will cause little ware or fraying on itself or the wire rope loop. To tension a length of wire rope, a turnbuckle is used. Each end can have a hook or one a hook and one an eye. The wire rope is secured to one end and then the ends rotate to extend or retract a threaded bolt to add or release tension. For more information about ordering or finding the proper size wire rope accessories, please contact Armstron Alar Chain Corporation by phone or email us at chain@chain-cable.com. Or fill out our easy contact for along the right and include your questions or part number for the wire rope accessories you are looking for. One of our wire rope sales associates will get back to you shortly with the information requested. We thank you for your interest in wire rope accessories and hope you check out our full catalog of chain and wire rope products as well.